In the last three decades, Somalia has been associated with such horrible terms as ‘state collapse’, ‘civil wars’, ‘foreign intervention’, ‘warlordism’, ‘famine’, ‘piracy’ and ‘terrorism’. This depiction was in contradiction to its earlier images as the cradle of the human race, the kernel of ancient civilizations, the land of Punt, a homogeneous nation-state and the first democratic state in Africa. So how did things fall apart in the country? This Volume 1 of a two-volume narrative, Dr. Abdullahi explores the history of the people of Somali peninsula since ancient times, the advent of Islam and colonialism, the rise and fall of Somali nationalism and the perspectives of the Somali state collapse. 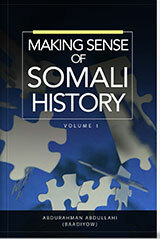 The book uses a unique thematic approach and analysis to make sense of Somali history by emphasizing the responsibility of Somali political elites in creating and perpetuating the disastrous conditions in their country.